NO HE DIDN’T … BARACK OBAMA REFERRED TO DISTRACTIONS IN WASHINGTON AS PHONY SCANDALS!!! Is Obama done speaking yet … Good grief this might have been one of the worst, rambling speeches I have ever heard. President Barack Obama’s speech on the economy was touted as being an important speech to help the economy and job growth. Instead, all we got from the “community agitator” was the same old tired economic agenda from Obama, blame Republicans and a new smear … calling the scandals that have plagued the Obama White House, “phoney scandals”. Even the WAPO had to print that Barack Obama’s new economic plan was the same as his old plan. One that has failed, provided more debt to the United States and has given us the worst economic post recession job growth period in history. What was the point of this speech? It certainly could not have been to bring Republicans and Democrats together to solve the problems of a floundering US economy. Phony scandals? Seriously, Barack Obama thinks the death of border agent Brina Terry as a result of Fast & Furious is a phony scandal? Obama thinks that the death of four Americans in Benghazi, including Ambassador Chris Stevens a phony scandal when it was the Obama WH that put forth a false and phony narrative that the terror attack was a result of a video? Who scrubbed the Benghazi talking points Mr. President? And the targeting of Conservative and Tea Party organizations by the IRS that was said to be only a couple of rogue agents and has now spread to many offices, Washington, DC and the White House counsel, that is a phony scandal as well? Wasn’t it President Obama who called this outrageous behavior? Now it is a phony scandal as it gets closer and closer to 1600 Pennsylvania Avenue. What about the going after of AP reports and James Rosen of Fox News, those were phony scandals as well? 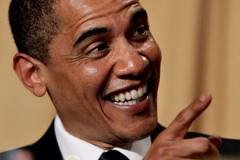 What Obama is counting on: Hey America, you bough my BS for 5 years and 2 elections … what’s another 1200 days? Things are getting better in areas like private sector job creation, home construction, energy independence and health care. But, the country isn’t all the way back yet. Republicans are looking out for the wealthiest Americans at the expense of the middle class. Times need to change. That’s a nice rhetorical flourish and there are, without doubt, some things that Obama can make happen in regards the economy via executive order. But, to make any major progress — a grand bargain on debt and spending for example — President Obama needs Congress, including the House that remained in GOP hands in 2012 despite his stronger-than-expected victory on the same day. From The Weekly Standard: Older, But Not Wiser – Obama’s first speech in a series is a predictable bust. Speaker of the House John Boehner ripped the president for his speech, Obama speech ‘an Easter Egg with no candy’. Personally I thing my comparison would have been a bit more harsh than providing the illusions of a fluffy bunny. Americans are suffering and all people should be sick and tired of a class warfare president who is more intent on making political points than helping “We the People”. Obama’s agenda has failed and if we give this failure any more lip service, the USA will look like Detroit. Just how bad was Obama’s speech … it had bipartisan support against it! Who knew that the Democrats Obamamessiah would turn into Richard Nixon and call all the scandals that mired his administration false and phony. Welcome to Chicago-style politics. President Obama has no intentions of fixing anything. Obama is doubling down on his failed policies and looking to blame others for his actions and agenda. WAKE UP AMERICA … IF YOU ARE NOT CAREFUL THE USA IS GOING TO BE DETROIT. When it is considered that the Senate, Congress and Judiciary are stacked with RINOs … the arrogant Islamic appeasing/Marxist Barack Obama is not going to be held accountable for any of the scandals that are destroying the American Way. Think about yesterday’s vote to challenge the NSA overstepping of power. If it had not been for Republican votes …. a window of opportunity to bring down this administration would have been opened. Could it be that a Conservative Party needs to be established with vetted candidates for all offices at State and Federal level? The 217-205 roll call Wednesday by which the House rejected a challenge to the National Security Agency’s secret collection of hundreds of millions of Americans’ phone records. A “yes” vote was a vote to halt the NSA program; a “no” vote was a vote to allow the program to continue. Voting no were 83 Democrats and 134 Republicans. Allen West does not have the support of Speaker Boehner in his efforts. Will other Republicans in Congress support Allen West in his quest for the the truth encompassing the happenings encompassing the Benghazi attacks. Republican leadership in the House, including Speaker John Boehner, R-Ohio, believes the matter can be investigated by other committees. Boehner has repeatedly opposed the creation of a new committee and, last year, assigned five standing House committees — Armed Services, Foreign Affairs, Intelligence, Judiciary and Oversight — to examine the matter. …. That’s not enough for West, who will be calling for a new committee on Tuesday. The event will feature a large petition demanding a full investigation by a new committee which has already been signed by 1,000 veterans. There will be efforts to bring similiar petitions to every congressional district in the nation. In the meantime, U.S. Rep. Steve Stockman, R-Texas, is trying to get a discharge petition signed to get the bill heard on the floor but he needs the support of 218 congressmen before that can happen. these “phony scandalsa” got Americans killed at the hand of our own phony president and his gang of street thugs. Votes cast on Thursday by several Republicans went a long ways to upheld Obama’s words “phony scandals”. Why did capital “C” Michele Bachmann cave. obama cannot put 3 sentences together without at least one of them being a lie. this idiot that HE IS ‘Washington’! This grown man is vacant of mind for sure. SM: You know you are in Obamaland when … a President of the United States thinks he is a a political outsider. Hyenas always show their teeth!!!! Are media buying into ‘phony scandal’ claim? The “phony scandal” line was the unofficial talking point of the week in Washington. White House Press Secretary Jay Carney made it his fallback retort from the podium — when asked about the president’s new wave of speeches on the economy, Carney explained Obama was trying to refocus Washington away from “fake” controversies.